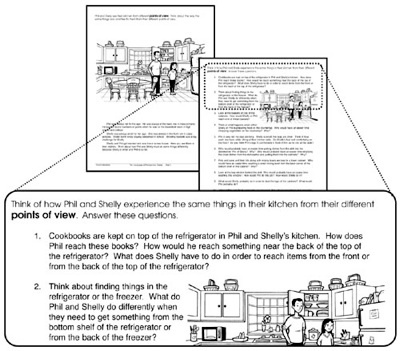 Work on social language and help your students feel more comfortable in social situations as they learn to see things from someone else’s point of view with The Language of Perspective Taking. An important milestone in a child’s development is seeing things from the perspective of someone else. The ability to understand another’s point of view contributes to the development of pragmatic language and communication and is a cornerstone of literacy as well. 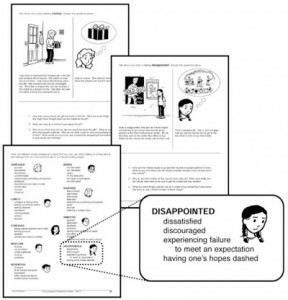 This interactive workbook has pages for both students to work on and guides for teachers that explore emotions, empathy, and how feelings are affected by various factors and experiences. This week only, save 15% on The Language of Perspective Taking by entering the promo code BLOGLPA at checkout. *Offer expires on March 20, 2012 at 11:59 pm EST. Not compatible with any other offer. Be sure there are no spaces after the Promo Code when you enter it at checkout. Written by: Different Roads to Learning on March 13, 2012. This entry was posted in Academics, autism, autistic spectrum disorder, Difflearn Promo Code, Pick of the Week, Speech & Language and tagged ABA, Applied Behavior Analysis, autism, autism education, autistic spectrum disorder, conversational skills, generalization of skills, language development, learning, Resources, teaching tools by Different Roads to Learning. Bookmark the permalink.